I saw an Inconvenient Truth when it first came out in 2005. I was inspired then – but left feeling like I hadn’t heard anything new from when I was an environmental studies major at Baylor University. At the Stewardship of the Earth luncheon Thursday with Al Gore at the Celebration of a New Baptist Covenant (watch video here), I had a much stronger reaction – what I would term a response to the call to action, a renewing of my faith and my resolve that Creation Care is the appropriate response to the Gospel. Gore told us that in Japanese, there are two characters for the word “crisis”: danger and opportunity. In the few years since the movie came out, the climate change has become a greater crisis. We have the great opportunity, then, to do things better. Climate change is a moral and ethical issue. It is not a theory to debate philosophically. One) I believe that God created the heavens and the earth and said it was GOOD. And God created us to be stewards of the Creation. Two) Stewardship of the earth, care of creation, means care of all creation: including those created in God’s OWN IMAGE. This is what I was convicted of again through Al Gore’s presentation: Climate Change affects the poor and downtrodden the most significantly, and they are LEAST responsible for it. If we are to love our neighbor, then we MUST be engaged in changing policies and attitudes towards the global climate. The world is waiting for us, the ONLY developed country not to join in the Kyoto Protocol, to be the world leader we claim to be. A new world compact on climate change is in the works, and the US can choose to be a partner to help reverse the impacts of global climate change. If you don’t think that policies on climate change matter, look at this picture of the border between Haiti and the Dominican Republic. 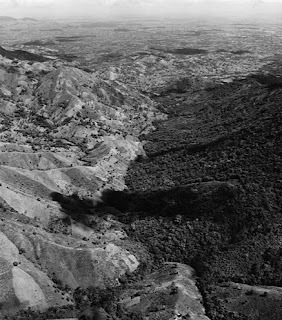 You can see the complete devastation of deforestation in Haiti (where the per capita GDP is $713 and civil unrest due to poverty is rampant) on the left. On the right is the Dominican Republic where they have chosen to use their environmental resources as an economic asset, thus preserving their forests. This is an example of exposing the fallacy that protecting the environment and economic success are at odds (another theme Gore touched on). Al Gore presented the scientific facts (you can look them up, watch the video, watch an Inconvenient Truth). But he also presented Biblical foundations and facts about the effect of climate change on humanity. Over 70% of the world gets its water supply from the 7 rivers whose source is the Himalayan glaciers. These are melting, changing the availability of water, creating alternate drought and flood events, and significantly impacting the ability of the poor of these areas to access water. The earth is the Lord’s and the fullness thereof. The environment is not a singular issue that we can choose to avoid if it doesn’t fit our particular ‘mission’. Creation care affects every single other aspect of our lives and our ministries. To ignore the Creation and the effects of humanity on it (and on the rest of humanity), I believe significantly hinders the Gospel. This is a problem that is solvable- the money, the technology, the commitment. Well, mostly on the commitment. We need the political will- as Americans we are responsible for 30% of the CO2 emissions in the world, which is more than the rest of the world except for Europe combined. Since we are part of the problem, we CERTAINLY must be part of the solution. We need to respond to this call—to be stewards of the Creation, entrusted to us by the Creator. Allan is the Director of Community Development for the Waco Chamber of Commerce, in Waco, Texas. A graduate of Baylor University (2007), he attends Highland Baptist Church. How does your faith impact your work environment? In what ways do you minister to your co-workers? My faith is the foundation of my entire existence, and it impacts my work environment through allowing me to help other people through service and the ability to make a difference. My faith calls me to think of others than myself, helping others, and showing the love of Christ. I discuss with my co-workers their lives, and try my best to make them laugh. I encourage them and pray for them when they are facing difficult times. I truly try to be a Christian example without having Christian on my sleeve. Why are you interested in the Celebration of a New Baptist Covenant? The New Baptist Covenant is a great way to network with Texas Baptists. I think this will be a unique way to collaborate, share and discuss our Baptist faith in a positive and meaningful way. Ryan graduated from Baylor University in 2001, and is a television editor in Fort Worth. He and his wife, Rebekah, attend University Baptist Church in Fort Worth. As far as my faith, it has been an interesting and wonderful experience in each of the different newsrooms I have worked in to talk about and share my faith. In the specific job I did [in Denver], many of my co-workers would come talk to me about what was going on in their lives, and again I was able to tell them how my faith had guided me in similar situations, or simply be a friendly voice to those who needed to vent. Coming back to Fort Worth has been an interesting challenge as there is such a head-knowledge about faith and christianity without really experiencing Christ. I would hope that again my coworkers would know about me just by being me being myself. Ben, a graduate of the University of Texas (BA, BS 2001; JD 2004), is a lawyer in Austin. First Baptist Church Austin is his church home, where he is also involved as a deacon. I live out my faith at work by representing Spanish-speaking clients pro bono through Volunteer Legal Services of Central Texas. I began taking VLS cases immediately after I became licensed because I felt a genuine calling to help these hard-working individuals in need. Working with VLS has been the most humbling, rewarding experience of my legal career. I minister to my co-workers by putting my faith in action on a daily basis, from treating opposing counsel with dignity and respect to engaging in service projects outside the work walls. I know that being Baptist in this day and age has taken on new meaning, most of it negative. There is an unhealthy and ever-widening disconnect among Baptists that has involved much finger pointing instead of seeking solutions. The New Baptist Covenant is a beautiful, positive counter-force to this disconnect that will unite Baptists and non-Baptists alike in constructive conversation by addressing the principles of discipleship, social justice and healing. What’s more, the New Baptist Covenant will cross racial, ethnic, societal and socio-economic lines. That’s how Jesus would have wanted it, and that’s why I’m excited to be a part of what I view as a Grand Awakening in Baptist life. Five years ago, while studying at Texas A&M University, I took a job as the youth minister of a small Baptist church in the Conroe area north of Houston. Having been born and raised in a large Bible church, I entered the Baptist world relatively oblivious to the situation I was getting myself into. Needless to say, it was not long after I began to identify myself as a Baptist that I became aware of the stigma associated with that name; stigma, may I add, that was well-deserved. I was a young Baptist minister living in a time when the leaders of my denomination were more concerned with the sexual orientation of Disney characters than the fact that roughly 7,000 children were dying of malnutrition each night. I was embarrassed that my denomination chose to use its resources to defend archaic scientific theories and remove women from leadership positions rather than to let justice roll on like a river, and I was enraged by the pettiness of it all. READ MORE. It was a time when a small number of powerful leaders had so corrupted the word “Baptist” that a large number of churches found it necessary to strike it from their name, keeping their denominational affiliation secret in order to maintain some level of credibility. And it was a time when I was willing to do the same. But although I felt hurt by the actions of some contemporary Baptists, what compelled me to stay within the denomination was the legacy left by Baptists of the past. These were men and women who shared a conviction that the freedom to work out one’s faith was more important than the transmission of right doctrine, and they believed that social concern was an integral part of that faith. They organized themselves so that each body of believers was free to choose its own path, answering only to God. They had a high view of the Holy Spirit’s power to direct the church without their assistance, and they refused to be restricted by any creed or statement of faith. This is a new time, and I am part of a new generation of Baptists—a generation that is rising up all around the nation. We are a generation that finds great value in the principles of our Baptist heritage and yet finds it unacceptable to define ourselves by the principles of our recent predecessors. We believe the people of God are called to participate in the kingdom of God. We believe social justice speaks louder than political coercion. We believe in serving the world, rather than withdrawing from it. And we will no longer capitulate to a system that promotes intolerance and injustice in the name of dogma. I see it all around me: I see it in the seminaries, I see it on the blogs, I see it in college groups and in the Emerging Church that is sweeping the nation. We are young, we are passionate about our values and we are mobilizing all across the country because we are unsatisfied, and we will no longer be silenced by the tyranny of a few powerful men. We are looking toward the future, and we are desperate for something new. As a result, several thousand young Baptist leaders like me are headed to Atlanta on January 30 to participate in the New Baptist Covenant. We are going because we believe the next chapter in Baptist history is going to start sounding more like the first. We are going because we believe Baptists of tomorrow must adopt an entire new set of values—values big enough to include renewed sense of social justice and racial reconciliation. We do not expect to change 30 years of corruption in three days; we only hope to take the first step on the journey we have been called to travel. This little church proved very good at discipling that undisciplined young man and initiating him into the folkways and mores of Southern culture and Southern Baptist life. They gave me The Living Bible and the KJV and taught me to read them every day. They drilled me in how to share my faith. They had me read Hal Lindsey and W.A. Criswell. They taught me “Pass It On” and “I Wish We’d All Been Ready.” The pastor, Warren Boling, preached Jesus in a King James cadence. They taught me how to drink iced tea. And they so emphasized ministry and missions that it was not surprising that I experienced a call to ministry within a year of my conversion. I have been pursuing that call ever since.In some ways mine was the prototypical Southern Baptist experience. I learned the Bible in detail, strict codes of personal morality, a disciplined devotional life, how and why to “witness,” and the centrality of missions and ministry. More than that, I learned love and grace, mainly from their example. When I messed up, that community loved me. When I stood up at the Royal Ambassadors’ banquet my senior year and proposed the merger of the RAs with the Acteens, they gritted their teeth and kept on loving me. When I proposed that we hold a dance at church to bring in new youth, they graciously referred it to a committee, where it is apparently still being studied. When I brought my playing cards for some gin rummy during youth-choir supper, the church ladies firmly but kindly asked me to put them away. This church knew who they were and what they believed, but they weren’t angry about it. They initiated me into their way of life, which took some doing, and managed to do so without judging or condemning me for my many mistakes. I will be grateful for that love, always. I am firmly convinced that throughout the Baptist world — black, white, Asian, Hispanic, African and so on, in all of our dozens of denominations — one can still find thousands upon thousands of individuals and churches that feel something like Providence Baptist Church did in those days when I needed it so badly. Such churches are centered on Jesus Christ. They preach the authoritative and inspired Bible as refracted through the tender lens of Jesus Christ. They are morally serious. They focus on obeying the Great Commission through evangelism, discipleship and missions. They build meaningful experiences of Christian community, they know what they believe but are not overly focused on doctrinal purity. They respect the freedom of fellow believers to express their faith in differing ways. And above all they love people. They are open, trusting, welcoming, kind and warm-hearted. They look you in the eye. They hate fighting. They are known for what they are for, not what they are against. I believe I will find people who are looking to include as many different kinds of Baptists as possible, rather than to exclude some who do not quite qualify for one reason or another. I believe I will find a quite Baptist spirit, as believers and congregations freely choose to fellowship together and work together on matters of common concern, without feeling the need to control each other or to set the terms of everyone else’s engagement. I felt like this column touched in so many ways on really important issues, many of which this blog has brought up before. David Gushee is a Baptist ethicist whose writing always makes me think. I for one will be attending his special interest session on Peacemaking at the Celebration. I spent a large part of this past fall traveling around Texas to different cities, listening to what young adults had to say about being Baptist. I was encouraged in many ways with what they had to say about being Baptist, about engaging the world for Christ. I am sold on being Baptist. For me, the freedom which we hold dear, which we early on fought for both for ourselves and equally for others, is what continues to connect me to Baptist life. We are a messy, dissenting bunch. But it is because we value each person’s voice (ideally), knowing that God may be speaking through them. I like congregational church governance. I can’t see any other way of ‘doing’ church- committees, messiness and all. Our church is talking seriously about sponsoring a new congregation in our area. But we seem headed for a meltdown. Several folks insist “Baptist” must be kept out of the name of the new church. Surely there are moral grounds for requiring a Baptist church to include “Baptist” in its name. However, there are some ethical issues connected with a church’s name and its denominational identity. First, it is unethical to have “Baptist” in your name and not really be a Baptist church. Of course, there are many issues about which Baptists disagree. However, there are some issues that are non-negotiable. You cannot claim to be a Baptist and not believe in and practice these fundamental Baptist tenets. For example, if a church does not allow all members to participate in decision-making, then it cannot be a Baptist church—regardless of its name. Third, it is embarrassing and sad that many Baptists now feel the name “Baptist” has been soiled. There are many kinds of Baptists, and no church can agree with every stripe of Baptist. Nevertheless, “Baptist” is an honorable name, and I am happy and proud the church I serve kept “Baptist” in its name. I believe true Baptists should live in ways that will help redeem the name. So, lets talk about being Baptist- what are your thoughts? Is your church struggling with this issue? Should they be?